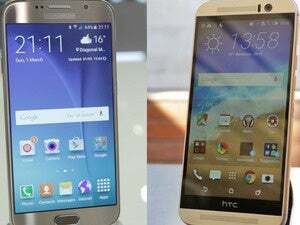 HTC One M9 vs. Samsung Galaxy S6: Which flagship phone will you want? But with the Galaxy S6, Samsung is finally changing the narrative. The new flagship phone is a bold departure from the detestable polymer-body handsets Samsung has been throwing at us lately. With the Galaxy S6, it feels like Samsung preserved all the previous flagship ingredients that actually worked, and then stuffed them into a stunning new glass-and-metal body. 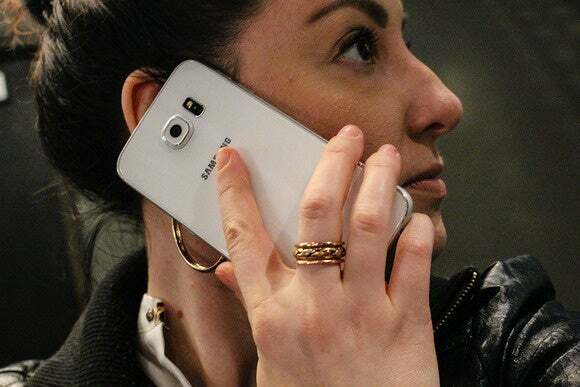 Frankly, the S6 is the Samsung phone we should have had a year ago. This is the last thing I want to admit as an Android user, but apparently it’s how you sell smartphones today: Make the product appear just as posh and stylish as Apple’s iPhone, and consumers will flock to it in droves. It worked for Xiaomi in China, and now Samsung’s going to take a stab at it, too. Glass. Metal. That’s all there is to it. 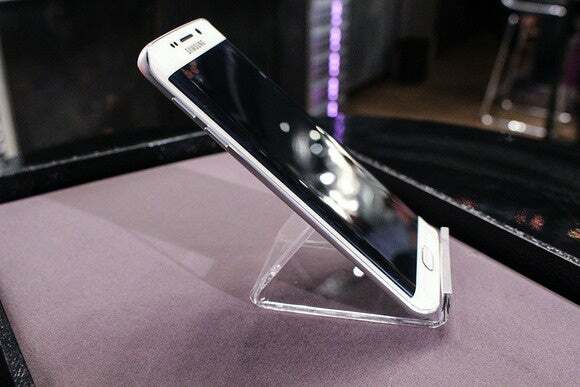 I can’t help but notice the similarities between the Galaxy S6 and the iPhone 6, especially with the white S6 version. That pearlescent white back? The brushed silver frame around the edges? The perforated speaker grill on the bottom? It’s uncanny. This bottom part remind you of anything? Even if the Galaxy S6 does sort of resemble something out of Cupertino, it’s evidence that Samsung has wised up to the basics of good design. We’re no longer living in a world dominated by basic plastic phones, and if you’re going to be the big fish in the Android pond, you have to jump on the upmarket bandwagon. The S6 Edge is a curved phone design that works. While the standard S6 merely catches up to respectable design, the curved version of the Galaxy S6—the Galaxy S6 Edge—reminds us there’s still ingenuity left in Samsung’s mobile hardware division. It’s difficult to see in my photos, but the 5.1-inch display curves ever so slightly on either side. Perhaps the company has been too timid to take such big risks until now. Or perhaps it’s finally figured out what works. Samsung opted for a subtle curve on either side of the device rather than bending it in the middle, like LG’s G Flex 2. This design certainly works for me. Look at those curved edges—the way they arc downward only slightly, without ruining the whole effect of holding a smartphone in the palm of your hand, like the Galaxy Note Edge did. I hated the Note Edge, but I loved holding the Galaxy S6 Edge. Both the flat and curved versions of the Galaxy S6 are two of the most comfortable smartphones I’ve used in a while—even more so than the HTC One (M8), which was my daily driver for most of 2014. The One sometimes felt too tall and too narrow, while Samsung’s Galaxy S6 felt good throughout the hour I held it—as if Goldilocks had finally found her perfect bowl of congee. Both the Galaxy S6 and Galaxy S6 Edge look good, too, like premium phones made for premium people—or at least, that’s the kind of lifestyle promise these smartphones will attempt to sell. There’s just one problem, though: Samsung will need to produce convincing marketing to go with its new flagship devices, because the upper echelons of society (and those who strive for that station) just aren’t aligned with Team Android. That said, the Galaxy S6 definitely has a story to tell beyond the fact that it’s just another Samsung phone. 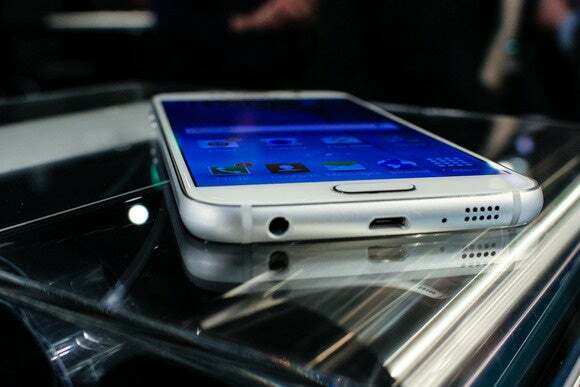 Unlike a majority of its predecessors, the Galaxy S6 is powered by Samsung’s speedy new octa-core Exynos processor instead of a Qualcomm chip. The company says this new 14nm processor promises better power-consumption because it has four cores devoted to battery efficiency, and four cores dedicated to processor performance. Now, that said, there’s been rumbling in the rumor mill that the processor switch-out is actually due to overheating issues with the Snapdragon 810. We can’t confirm or deny either of those claims, but we can say that the phone felt snappy and responsive. We’re excited to finally get some playtime with a Samsung SoC when it’s ready to review. Samsung may have overhauled its chassis design, but its software still needs a little work. Despite the Lollipop update, it’s not anything spectacularly new. Sorry, America. It’s still blue. I will give the company some credit, however. While TouchWiz is still blue-hued in some areas and its icons don’t really match alongside Google’s suite of apps, the Material Design is there underneath it all. You gotta admit: this looks better than previous versions of Samsung’s TouchWiz. There are Cards in the app switcher, and Samsung’s own apps feature bright, bold colors on a flat layout. Samsung also left in some of its own software additions, like Multi-Window, which can be used from the multi-tasking screen. It also swears it has streamlined the interface, and cut it down in a couple of places. From my brief time with it, however, all I can say is that the S6 still acts and feels like a Samsung phone. Maybe I’ll feel differently after a week with it. You can’t run to your carrier store and pick up a Galaxy S6 or Galaxy S6 Edge just yet, but you can expect them to hit stateside sometime this spring. When it does, we’ll have a full-blown review, complete with benchmarks, beauty shots, and a lab test with the Galaxy S6’s newly refined 16-megapixel rear-facing camera.